Ask anyone who has owned a pet and they’ll assure you that, yes, animals have personalities. And science is beginning to agree. Researchers have demonstrated that both domesticated and nondomesticated animals—from invertebrates to monkeys and apes—behave in consistently different ways, meeting the criteria for what many define as personality. But why the differences, and how are personalities shaped by genes and environment? How did they evolve? The essays in Animal Personalities reveal that there is much to learn from our furred and feathered friends. The study of animal personality is one of the fastest-growing areas of research in behavioral and evolutionary biology. 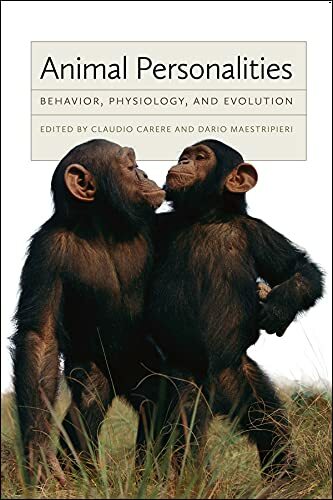 Here Claudio Carere and Dario Maestripieri, along with a host of scholars from fields as diverse as ecology, genetics, endocrinology, neuroscience, and psychology, provide a comprehensive overview of the current research on animal personality. Grouped into thematic sections, chapters approach the topic with empirical and theoretical material and show that to fully understand why personality exists, we must consider the evolutionary processes that give rise to personality, the ecological correlates of personality differences, and the physiological mechanisms underlying personality variation. Claudio Carere is adjunct professor of animal behavior and animal physiology in the Department of Ecological and Biological Sciences, Tuscia University, Italy.